Opposition movements in East Germany, especially the independent peace movement and the ecological movement, sought support from the church, the only institution in the GDR not controlled by the state. The church offered opposition groups meeting rooms and a forum for voicing their concerns. Since 1982, the church had been holding prayers for peace, demanding not only a peaceful resolution to the Cold War but also respect for human rights. The church's message stood in stark contrast to the one put forth in official GDR peace propaganda. 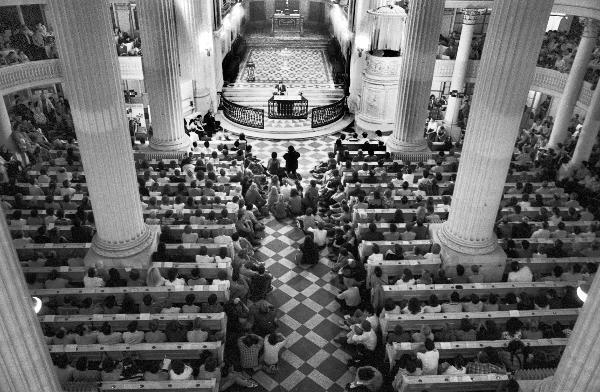 After about 1,200 anti-regime protesters gathered on the square in front of Leipzig's St. Nicholas Church [Nikolaikirche] after a prayer for peace on Monday, September 4, 1989, similar demonstrations became a weekly event in Leipzig. At first, the police and the Stasi tried to suppress these "Monday demonstrations" with violence, but they were unsuccessful. The photo below was taken during a prayer for peace and non-violence in St. Nicholas Church on October 9, 1989. After the service, 70,000 people demonstrated throughout downtown Leipzig for reform in the GDR. Photo: Waltraud Grubitzsch.